View of Trabzon from Boztepe. Currently, travel to Turkey often consist of visiting Istanbul, The Mediterranean coast and Cappadocia. However, the Black Sea and is making its way and there are more and more tourists who enjoy this part of the country. Pontic Alps reach the coastline and shape a landscape that reminds us very much the Spanish Cantabrian coast . The green color of the forests and fields of tea dominates one of the areas with more history of Anatolia. There were settlements in the year 1000 BC in Trabzon and Trebizond was founded over 2500 years ago, during which it has been a part of all the big empires in the region.. If you come to Trabzon from the Aegean, immediately understand why the Greeks called it the Black Sea and. The cloudy sky and deep waters give it a grayish color that should impact the sailors who came from Miletos in 756 BC who were used to the bright blue sea that they usually navigate. A history like that of Trabzon is not easy to summarize. Trebizond was Greek, Persian, Pontic, Roman, Byzantine and Turkish. He was even the capital of the Empire of Trebizond from the thirteenth century to the fifteenth. Suleyman the Magnificent was born in Trabzon in 1494. Today it is the main Turkish city on the Black Sea and the capital of the province of the same name. Trabzon produces 20% of the Turkish tea and the same percentage of national fishing production. As it is covered by forests in 40% of its surface, Agriculture in the province of Trabzon is not very important in quantity, but the quality of its products is known throughout Turkey. The majority of the Turkish population is Muslim but there are some Greeks who still speak the ancient Greek Pontic. There is also a minority consisting of the original settlers of the area, the Laz, who have their own language and whose women wear the traditional red and black colored fabrics. From the tourist point of view, Trabzon is a necessary step on our way to the fabulous monastery of Sumela and our stay in the city is a good opportunity to know the Church of Hagia Sophia of Trabzon but Trabzon offers many other attractions and we must make our way through the city to know them. Frescoes of St. Sophia. Trabzon . The church Hagia Sophia Trabzon is located West of the city centre, It is a beautiful building of the thirteenth century with a separated bell tower besides the main building. The interior is decorated with frescoes and you can stroll around the gardens surrounding the church overlooking the Black Sea and the city. It has recently been converted into a mosque and the interior decoration can not be seen, although the visit is still highly recommended. The Ataturk Kosku It is an art nouveau style building built by the Greek banker Constantine Kapagiannidis in 1903. Ataturk stayed there in 1924 when he visited the city. He was accommodated again in the building during his third visit in 1937, today it is a Museum. The outside has well kept gardens and inside you can see a complete collection of furniture of the time and pictures of the founder of the Republic. There are two areas of the city not to be missed, Boztepe Park and the city center near Ataturk Alani. 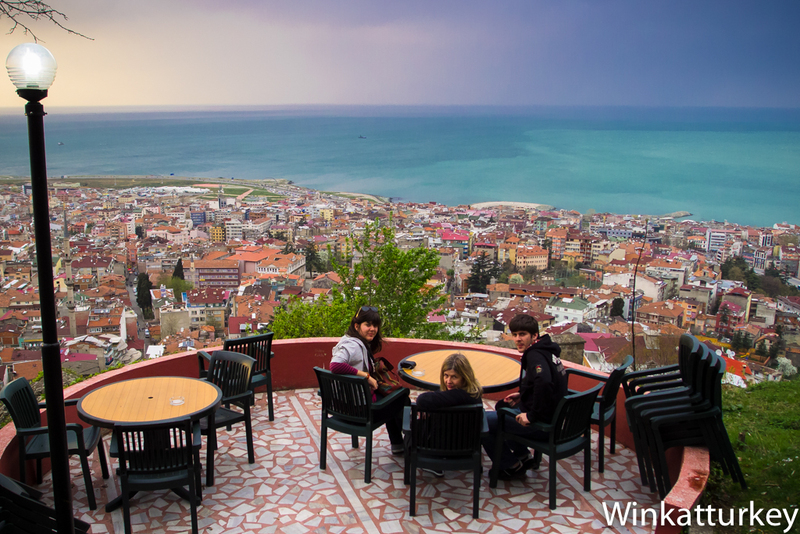 Boztepe is on a hillside south of the city from where you can enjoy a magnificent view of the sea and Trabzon. On the terraces of the cafés of Boztepe is typical to order large double bodied teapots to serve tea ourselves. The best practice is to go at sunset and enjoy the views while taking excellent Black Sea tea. Remember that the Turks prepare a highly concentrated tea on top teapot and serve usually no more than a third of that tea in the cup and then fill the glass with hot water from the lower kettle that has a small tap . In Ataurk Alani you will find restaurants and bars where you can try the hamsi of Black Sea, breaded in cornmeal fried anchovies served accompanied by Trabzon bread, one of the best known throughout Turkey. It is also typical of this area the mihlama, a local cheese served melted in a metal container that we can order as starter. The city bazaar is located very close, around Carsi Mosque. In its streets full of shops and people you will find typical red and black Laz scarves. It is highly recommended to go up to the top floor of the indoor bazaar, where a beautiful Ottoman atmosphere cafeteria will give us a break. A final recommendation, Trabzonspor is the team and the only city in Turkey with Bursaspor who has managed to break the hegemony of the Istanbul teams. The people of Trabzon love their team and we can see it by the great number of places where they sell shirts, scarves and all kinds of objects with blue and burgundy. If during our visit to Istanbul's we bought a Fenerbahce shirt, or Galatasaray or Besiktas, surely we will find a better occasion to wear it than during our visit to Trabzon. View map of Black Sea. Té en Boztepe. Trabzon .